Every person who is responsible for paying any income chargeable under the head "Salaries" shall deduct income-tax on the estimated income of the assessee under the head "Salaries" for the financial year 2018-19. The income-tax is required to be calculated on the basis of the rates given above, subject to the provisions related to requirement to furnish PAN as per sec 206AA of the Act, and shall be deducted at the time of each payment. 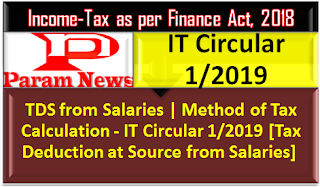 No tax, however, will be required to be deducted at source in a case unless the estimated salary income including the value of perquisites, for the financial year exceeds Rs. 2,50,000/- or Rs. 3,00,000/- or Rs. 5,00,000/-, as the case may be, depending upon the age of the employee. (Some typical illustrations of computation of tax are given at Annexure-I). 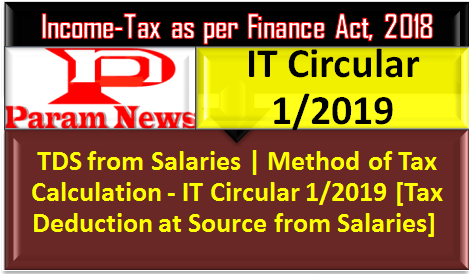 An option has been given to the employer to pay the tax on non- monetary perquisites given to an employee. The employer may, at its option, make payment of the tax on such perquisites himself without making any TDS from the salary of the employee. However, the employer will have to pay the tax at the time when such tax was otherwise deductible i.e. at the time of payment of income chargeable under the head ―salaries to the employee. For the purpose of making the payment of tax mentioned in para 3.2 above, tax is to be determined at the average of income tax computed on the basis of rate in force for the financial year, on the income chargeable under the head "salaries", including the value of perquisites for which tax has been paid by the employer himself. The income chargeable under the head salaries of an employee below sixty years of age for the year inclusive of all perquisites is Rs.4,50,000/-, out of which, Rs.50,000/- is on account of non-monetary perquisites and the employer opts to pay the tax on such perquisites as per the provisions discussed in para 3.2 above. Section 192 (2) deals with situations where an individual is working under more than one employer or has changed from one employer to another. It provides for deduction of tax at source by such employer (as the tax payer may choose) from the aggregate salary of the employee, who is or has been in receipt of salary from more than one employer. The employee is now required to furnish to the present/chosen employer details of the income under the head "Salaries" due or received from the former/other employer and also tax deducted at source therefrom, in writing and duly verified by him and by the former/other employer. The present/chosen employer will be required to deduct tax at source on the aggregate amount of salary (including salary received from the former or other employer). 3.4.1 Under section 192(2A) where the assessee, being a Government servant or an employee in a company, co-operative society, local authority, university, institution, association or body is entitled to the relief under Section 89 he may furnish to the person responsible for making the payment referred to in Para (3.1), such particulars in Form No. 10E duly verified by him, and thereupon the person responsible, as aforesaid, shall compute the relief on the basis of such particulars and take the same into account in making the deduction under Para(3.1) above. Here ―university means a university established or incorporated by or under a Central, State or Provincial Act, and includes an institution declared under Section 3 of the University Grants Commission Act, 1956 to be a university for the purpose of that Act. 3.4.2 With effect from 1/04/2010 (AY 2010 -11), no such relief shall be granted in respect of any amount received or receivable by an assessee on his voluntary retirement or termination of his service, in accordance with any scheme or schemes of voluntary retirement or in the case of a public sector company referred to in section 10(10C)(i)(read with Rule 2BA), a scheme of voluntary separation, if an exemption in respect of any amount received or receivable on such voluntary retirement or termination of his service or voluntary separation has been claimed by the assesses under section 10(10C) in respect of such, or any other, assessment year.